After reading these (albeit, ironically, grammatically crap) instructions for the use of the normal latrine, I couldn't resist looking at what one might be restricted to using, if one were too dumb to follow those rules. And this is it. Is this as bad as it gets? Some people have life so soft! 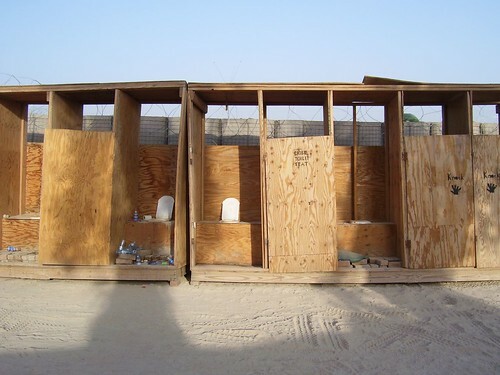 Well, I've used various strange holes in the ground at various places around the world, but these "Stupid People Toilets" look an awful lot like the toilets provided for festival goers to Knebworth waaaaaay back in 1979. Led Zeppelin headlined and they were still young then too! Only these look a heck of a lot better. Luxury even. Honestly! At Knebworth, there was more 2x1 frame and less privacy giving panels. The Knebworth design also did NOT have doors, just a half sack nailed roughly in place and which, quickly went "mysteriously" missing. The Knebworth versions also did NOT have toilet seats, just a roughly circular orifice cut into the construction, the entire of which was constructed over THE most disgustingly smelly OPEN PIT in an otherwise open field. And still, the users of said disgusting things were "too stupid" to confine their emissions to the bloody great pits provided. Suffice it to say that, pigs in a sty, shitting where they walk, live in similar, if pleasanter conditions! And, don't forget that I only visited the "Ladies"! You gotta wonder really, whom is most stupid. Rock festival goers who pay a goodly number of pounds to spend the weekend in a field, using toilets that no human being, not even a refugee from the world's worst disaster would use, in their right mind. At least you're paid to use them in the military! It's all harks back to the past today, but after the stupid people toilets we suffered in order to see Led Zeppelin live in 1979, then there was the time I slept while Elton John performed. No, I bet Sir Reginald won't be boasting about that to his friends. I was reminded, of course, because Elton John is coming to this island and the fuss that Tenerife is making about it is, it must be said, quite hilarious. Sure, he has a title and he's a big star, but ... Well, no I'm not going to say he's a "has been" because he's not that much older than me and I would like to think I could still hold my own (if I were to practice, the note I hold might even be the one I was aiming for too), but he's hardly this year's latest thing either. And, even when he was, well ... I'm one of those who can fail to be impressed. Hard to believe it was over 32 years ago, on June 21st, 1975, at the Mid-Summer Music Festival, Wembley Stadium, London, when I nodded off on the pitch during Elton John's performance of boring unfamiliar material. "It was the debut of the new Elton John Band and the entire Captain Fantastic & The Brown Dirt Cowboy album. It is played, in its original running order. Press reports indicate this was not a wise choice since the audience was not familiar with the material and many walk out during the set. The live performance of the album was planned to be released on the 30th Anniversary Deluxe Edition of Captain Fantastic & The Brown Dirt Cowboy, on September 13th 2005. DJ, Johnnie Walker serves as master of ceremonies. Elton headlines the show. Also on the bill for this show: Beach Boys, Rufus, The Eagles, Joe Walsh and Stackridge." "Ain't Nobody" else had heard of them then, but I only went to see Rufus. William Beebe said: "Before I started on my trip around the world, someone gave me one of the most valuable hints I have ever had. It consists merely in shutting your eyes when you are in the midst of a great moment, or close to some marvel of time or space, and convincing yourself that you are at home again with the experience over and past; and what would you wish most to have examined or done if you could turn time and space back again." Eight o'clock on a Sunday morning is not a time to be up and awake, much less when you've had a heavy night on a bateau mouche on Paris' River Seine the night before. We're a funny lot, but we British like our meat cooked. The French don't, it seems. It's a cultural thing. I'm not saying one is right or wrong, but about the only thing appetizing to our uncultured Anglo-Saxon palates, out of each of the seven courses at dinner, had been the wine and, fortunately or unfortunately, there was plenty of it to be had. The boat appeared to travel 200 yards in one direction, turn around and go back 200 yards in the other, repeatedly, all evening, while we ate drank. And the more the wine flowed, the more we giggled about seeing "yet another Eifel Tower" to our left or right. Paris, I discovered, under the influence of beaucoup de vin rouge, has lots of them. When Michael Palin visited Paris on his Hemmingway Adventure, stood beneath the monument and said, "Oh dear, the Eifel Tower again", I nearly spit out my coffee. Did he go on a bateau mouche trip the night before too? On a previous night we had the dubious pleasure of being served pink duck that had probably been no closer to an oven than a stroll past it on its way to the plate and, being bombed with tear gas at a restaurant in La Défense. I never was able to express my gratitude to the delinquents / protestors / terrorists for providing an excellent excuse to exit the restaurant without having to cause the great offence of sending the poor animal back to the kitchen to be cooked. A cursory hour or so of this three-day business trip had been spent at an exhibition near one of the previously mentioned Eifel Towers, after which lunch was attempted before going off to do a bit of essential window-shopping. Half a week's salary bought a coffee and the world's smallest salad in a rather grand looking cafe on Boulevard Haussmann. Starving to death, however, and needing a cheap filler, we headed for McDonalds in the alley between Printemps and Galeries Lafayette. Relief was in sight, so we thought. It even said all the normal things like "Big Mac" and "Fries" on the wall menus. Touriste Anglais (me): "Big Mac and Large Fries, Please." Touriste Anglais (2nd attempt): "Un Big Mac avec grand pommes frites, svp." And, in Paris, this "fast food" arrived in a mere half an hour. It isn't that fast food is totally frowned upon, because in the street in the same alley, we bought gorgeous crepes, cooked, served and eaten in a trice and that was by far the better bet. To be fair, on the Friday night we had enjoyed an absolutely excellent five course meal at an, admittedly touristy, old, narrow and quaint restaurant up in Montmartre, before making a tour of the red-light district of Pigalle and then going on to see the holes in the dancers' stockings at a second-rate cabaret near the famous Moulin Rouge. Daily drives down the Champs-Élysées, umpteen passes by the L'Arc de Triomphe on the way back and forth to our hotel in La Défense and a fleeting glance at the outside of the building, while driving past Le Louvre completed this low on substance, overloaded with tourist tacky, whistle-stop tour. Paris, like its food, should not be rushed. It should be savoured slowly. Such distilled, snapshot visits to Paris do it no justice and this trip probably only served to show me what I will definitely aim to avoid next time. Mais oui! Sunday morning, far too early and seriously hungover. Kidnappers, posing as tour guides, bundled us into a coach for what felt like an interminable twenty or so mile drive northeast to Chantilly to visit the historic Château de Chantilly. We were really looking forward to seeing it and, especially, to catching up on our sleep on the coach on the way. The latter, we were not going to do, however. And, by God, she was going to make sure we learn it all before we got there! She even shouted at a couple of people who were "rude enough" to nod off while this monotony of dry detail droned on in pigeon English. Everyone on the bus was hiding their faces and stifling giggles, in case they became the next victims of a right telling off from the schoolmistress. I blame the way history is taught in English schools (or how it was taught in my day). After hearing that they killed our king in the Battle of Hastings in 1066, never forgave us for Joan of Arc and, were our enemy in seemingly never ending wars, we were hardly encouraged to take much interest in French history. Since they chopped the heads off their own royalty, we didn't think the French did either. Almost all we knew on the matter came from fiction, such as "The Man in the Iron Mask" and "The Three Musketeers". So this diabolical diatribe came as a complete surprise to us and we hadn't a clue what she was going on about. We were bound to fail the exam we thought was coming! So we kept very quiet, apart from making appropriately impressed noises as we passed the grand stables on the way to the Château. The vista of the Château itself, was breathtaking. We did not have to feign any delight and no amount of force feeding of facts could possibly have dampened our enthusiasm for it, once we saw it. But we were tired and, having spent most of my childhood Sundays visiting every stately mansion the length and breadth of the British Isles, my appetite for and capacity to take in the grandiose and finery was waning fast. Herded from one grand room to the next, despite trying to make a concerted effort, we remained half oblivious. Until it called me. Wedged between an obscene number of seemingly identical, flamboyant, formal paintings of probably self-important nobility all vying for attention, there it was, in an overstuffed room with a sofa in the middle. Opposite the sofa was this simple (not in the execution, but in composition) painting of a young peasant boy, barefooted and sitting on a wall of an unimpressive brownish building. The boy was was looking down. For the rest of the time and, while everyone else was agitating to get onto the coach to leave, I just sat on that sofa and drank it in, hoping to burn the image through my retina and onto the "hard drive" of my memory. I've no idea what the painting was called, nor even who it was by. What I can remember clearly is the light, those soft, diagonal golden rays of Mediterranean sunlight, captured so perfectly by an expert artist's eye. No clear images remain in my mind of the interiors of the Château whatsoever, but I can still, after more than 20 years, close my eyes and see that impression of the painting as if I were still there.